Steel hulls became commonplace by the late 19th century. Description: One June 7, 1906 the Grecian struck a rock and sank in shallow water at Detour Village in the St. Mary's River. The ship was later refloated and taken in tow by the steamer Sir Henry Bessemer, to be brought to Detroit for repairs. 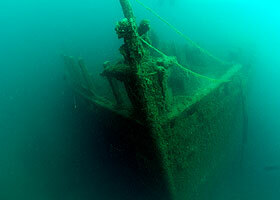 Unexpectedly, it filled with water and sank near Thunder Bay Island. Its crew escaped in lifeboats. Today the Grecian's bow and stern lie intact, while the midships portion is collapsed. The engine, boiler, propeller and deck machinery are all in place. There is also a steel canalon (salvage buoy) lying off the vessel's stern from a 1909 salvage attempt.